First off, by no stretch of the imagination was 1977’s original Disney live action-animation hybrid a classic. That said, this remake is also not close to such status. But it is very pleasant and thoroughly enjoyable in its own way. We first meet a five year old Pete at the moment he comes to lose his parents in the woods, something that all good Disney movie know how to play with. Lowery stages their car crash in a spectacular, almost surreal fashion, and then, rather than tease its reveal, promptly introduces us to the dragon. Elliot, as he will come to be known, is big, green and altogether furry. Six years on and Pete is now played by the splendidly names Oakes Fegley – seriously , has there ever been a better named-actor to play a feral child than Oakes Fegley? – and is found in the woods by park ranger Howard. But the saving of Pete as such, might well result in the extinction of Elliot – especially if nasty gun-toting, one-dimensional logger Karl Urban has anything to do with it. Lowery’s fairy tale is painted in the broad strokes that its basic plot implies. But it is done so with thought and feeling and a fair degree of style. Redford is welcome as a comfortable old codger presence – albeit a knowing one – as much as he is a character, and Fegley holds the screen more than outright impresses. 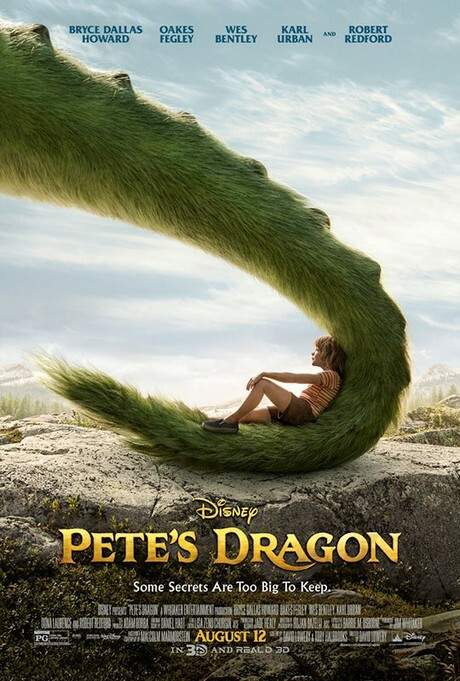 The new Pete’s Dragon is a considerable improvement on the old Pete’s Dragon (no really, forget what you remember – watch it again) and owes as much to Spielberg in places as it does to Disney (ET a very definite influence here.) It is, very simply, very sweet. And what’s wrong with that?